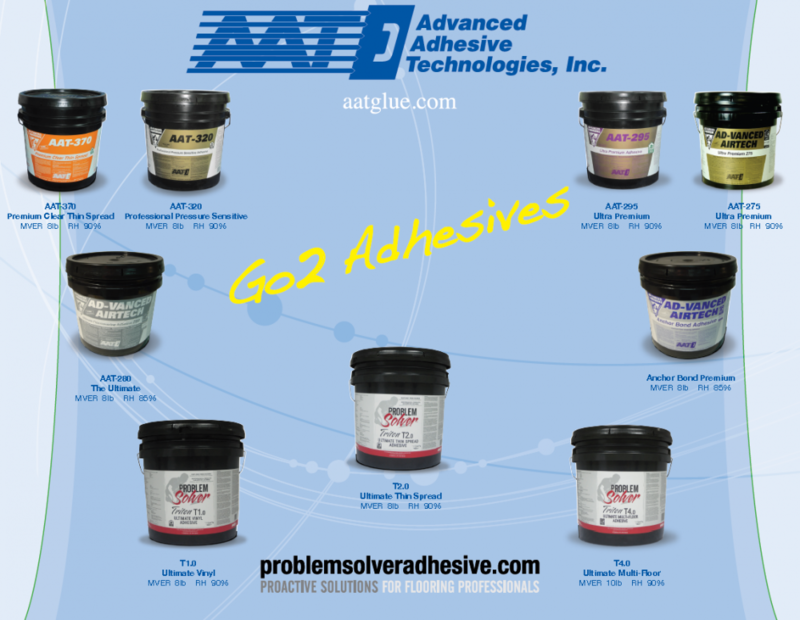 Advanced Adhesive Technologies, Inc. [Dalton, Georgia] has added another valuable performance enhancement to the Go2 Adhesive series. Our latest innovation is the result of an extensive R&D effort. The reengineered AAT-295 Ultra Premium Carpet Adhesive offers you a much faster drying adhesive resulting in significant time savings. Perhaps, the most important feature of the enhanced formula for you is the 295’s ability to be used over slabs with an in situ RH of 95%. This performance enhancement will add a margin of safety for you and the flooring contractor’s that choose the AAT-295 without increasing your cost. AAT-295 reduces the amount of open or dwell time required when direct gluing high performance carpets, thereby dramatically increasing the installer’s daily production capabilities without compromising the integrity of the installation. This high solids, low odor, solvent free and installer friendly adhesive can be used with virtually all broadloom carpets and is especially recommended for high performance carpet backings. Like all of our adhesives, this adhesive is protected by the CleanGuard® two-stage antimicrobial. CleanGuard is a specifically formulated broad-spectrum, anti-microbial agent that protects our adhesives and sealers from microorganisms, such as mold or mildew, in both the wet and dry state. The CRI Green-label Plus Adhesive Certification Program has certified AAT-295 as a “low VOC” adhesive. AAT-295 may contribute to the LEED certification of projects. AAT’s Go2 Adhesive formulas have been formulated to ensure superior adhesive performance under the very demanding conditions commonly found in today’s fast paced construction. Consisting of ten high performance adhesives, the Go2 series raises the bar for adhesive performance for a broad set of applications from broadloom carpet, LVT and LVP, VCT, sheet vinyl and modular carpet tile. AAT’s Go2 adhesives are formulated for mitigating applications over new concrete with in situ RH levels up to 95% and MVE rates up to 8lbs./1000sq.ft./24hrs. The Go2 series compliments the proven Triton Series from our Problem Solver Adhesives line up. The Triton series includes adhesives for sheet vinyl, VCT, LVT and LVP, rubber flooring and broadloom carpet. Problem Solver Triton adhesives can be used for mitigating applications over new concrete with in situ RH up to 90%, MVE rates up to 10lbs./1000sq.ft./24hrs and a maximum pH level of 11. AAT-535C Professional Wood Flooring Adhesive utilizes proprietary solvent technology to produce an aggressive, easy troweling, no slump wood flooring adhesive. AAT-535C is intended for use in new construction projects by professional wood flooring installers. Our R&D team has developed a superior performing adhesive that complies with all state and federal VOC regulations, including those from the SCAQMD. AAT-535C meets requirements for sale in all fifty states across the USA. The formula contains no chlorinated solvents, no isocyanates and is ozone safe. Our unique solvent technology produces the most cost effective formula. AAT-535C develops tremendous green strength along with rapid development of shear strength to maximize the professional’s efficiency. This advanced formulation requires no dwell or open time. Further increasing the professional’s efficiency, rolling of the flooring during or after the installation is not required. It cleans easily and will not damage the finish of the wood flooring. AAT-535C adhesive is formulated for use when installing bamboo, solid wood and all types of engineered wood flooring over commonly encountered sub-floors. With all of the performance benefits of traditional solvent-based adhesives the 535C breaks new ground in achieving spread rates of up to 90 sq.ft./gal. for engineered flooring. AAT proudly manufactures AAT-535C in the USA. AAT-322 is pressure sensitive adhesive for fiberglass sheet vinyl. AAT-322 FG Sheet Vinyl Pressure Sensitive Adhesive is a high quality, acrylic based adhesive that is formulated for installing sheet vinyl with fiberglass cores and PVC cushioned backs. Certified with the CRI Green Label Plus designation for low VOC adhesives, and meets or exceeds all EPA and OSHA guidelines regarding Indoor Air Quality. AAT-322 can be used on all grade levels over concrete and approved wood sub-floors in the absence of moisture emissions and alkalinity. AAT-322 is freeze-thaw stable and this zero VOC adhesive is protected by the CleanGuard® two-stage antimicrobial. The Advanced Poxyfill Wood Floor Repair Kit by AAT contains a specifically formulated adhesive for easily correcting hollow and "popping" spots that can occur in wood flooring installations. The kit contains everything needed to make an effective and professional wood flooring repair. Our unique cartridge system does not require expensive dispensing equipment. The Advanced Poxyfill cartridge and adapter is used in a standard caulk gun. This feature significantly reduces the costs associated with traditional repair kits. Advanced Poxyfill Repair Adhesive can be used to repair hollow spots under solid and engineered wood flooring, including bamboo. Unlike water-based repair products, the Poxyfill adhesive will not expand the wood flooring. The Advanced Poxyfill Repair adhesive is easy to use and forms an outstanding bond to concrete and wood. The blending nozzle meters the two-component adhesive in the correct ratio, generating an extremely aggressive bond to substrates and to filling voids in subfloors that do not meet industry standards for flatness. The adhesive begins to cure right away and is fully cured in 30 minutes. ©2012 Advanced Adhesive Technologies Inc.